it's been over six years since teenage engineering released OP-1, the revolutionary portable all-in-one synthesizer which has now become an icon in the music industry.to be honest, many were skeptical at launch, labeling it as a toy and not a real synthesizer because of its color coded knobs, its creative user interface, and for some it was just because of its size – a synthesizer has to be big to sound big right? today, with the introduction of the all new OP-Z, we will push the boundaries even further. this time the machine is so small we guarantee it will upset you. it's about half the size of OP-1, but comes with more dsp power that consumes less energy so now you can fly the atlantic 4 times back and forth, sequencing complete songs on 16 dedicated tracks before you run out of power. when ready to land, just slide it in your inner pocket. still, OP-Z is about a lot more than just composing music. the Z stands for the third dimension, the depth, the creativity involved in making music. imagine animated art and videos that accompany your live show, or sequenced lighting, all the way down to composing your own interactive software. some people would call a device like this a dream machine. 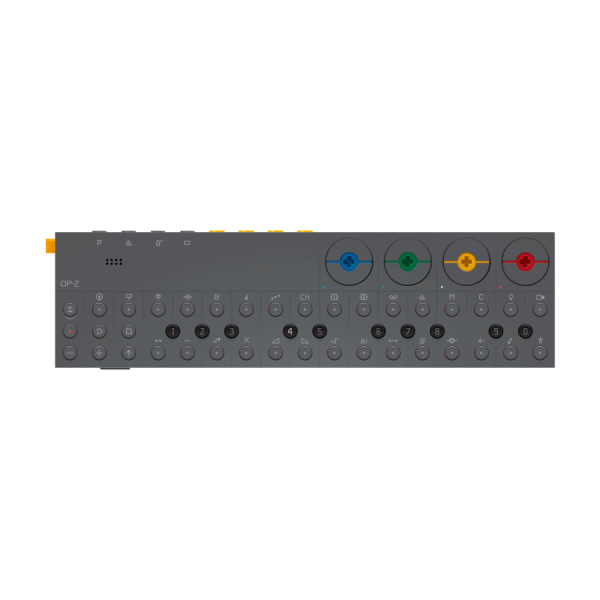 we call it OP-Z.centered around an advanced 16-track sequencer where all tracks run independently, OP-Z makes individual track speed and track length possible.in addition to this it's possible to add unique step behaviours to every one of the 16 steps: a feature we call step components. think of this as dual layer sequencing where the first layer is a traditional 16 step sequencer, while the second layer adds variation per cycle, note variation, micro sequencing, direction, parameter changes, re-trig's and much more, all on just one single step. all 14 components have 10 values and behaviour programs. the product of all this is that you have 140 ways to alter just one single step. probably more than most people can handle.and to make step composing really intuitive and super fast, all keys are backlit with multi-color leds with instant machine feedback, a must-have for poorly lit club gigs and late-night-in-bed composing. actually, the print on the unit itself is made with a special glow-in-the dark-paint.a pretty cool ’world's first’ for synthesizers.